This group meets every monday 1:00 - 2:30 p.m. September through May We learn how to knit, and learn different types of patterns. We enjoy a fellowship with other women, share a devotion and prayer requests. Some of the groups we have made items for include: the oncology department at Howard Regional Hospital, Patton Manning Children's Hospital in Indianapolis, Open Arms in Kokomo. We meet in the room next to the Sanctuary. 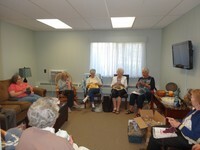 We also have a few Crocheters.